Bryophytes are simple plants; they are the simplest plants that grow on land. There are three types of bryophyte. These are mosses, liverworts and hornworts. Bryophyta is the traditional term for this division of non-vascular plants. In some modern classifications the term is restricted to the mosses. However, as the group shares some key features (such as an alternation of generations with the haploid plant body dominating) the term is still useful. The non-vascular plants are, in any event, related. It is thought that liverworts evolved from green algae. Then other plants, including moss and hornworts, evolved from liverworts. A person who studies bryophytes is called a bryologist. The study of bryophytes is named bryology. Like all land plants (embryophytes), bryophytes have life cycles with alternation of generations. In a haploid gametophyte each cell has a fixed number of unpaired chromosomes. The green gametophyte gives rise to a diploid sporophyte, which is reddish. Each of the gametophyte cells has twice the number of paired chromosomes. 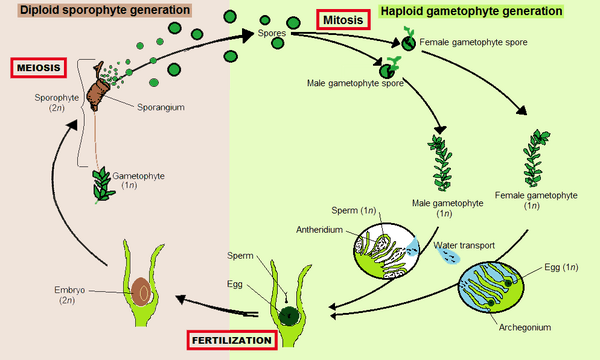 So, gametophytes produce haploid sperm and eggs which fuse to form diploid zygotes that grow into sporophytes. Sporophytes produce haploid spores by meiosis, that grow into gametophytes. Bryophytes are "gametophyte dominant", meaning that the more prominent, green, longer-lived plant is the haploid gametophyte. 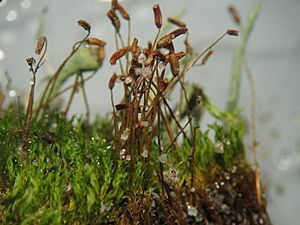 The diploid sporophytes appear only occasionally and remain attached to and nutritionally dependent on the gametophyte. In bryophytes the sporophytes are always unbranched and produce a single sporangium (spore producing capsule). Hornworts include those bryophytes that are believed to be the closest living relatives of the vascular plants. Bryophyte Facts for Kids. Kiddle Encyclopedia.